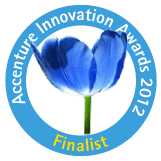 Abundnz participated in the competition for the Accenture Innovation Awards 2012. Our company ended as finalist, and the pAMS technology platform was thus elected to belong to the top of Dutch innovative concepts. A publication on the use of pAMS technology in biotech drug development has appeared in Bioanalysis 5(1) 53-63 (2013). Background: Microdosing is a technique for studying the behavior of compounds in vivo at 1/100th of the dose of a test substance calculated, based on animal data, to yield a pharmacologic effect. In microdosing, use is made of accelerator MS (AMS). In this study, we investigated whether 129I-labeling of proteins with subsequent AMS measurements is a suitable method to perform microdose studies with therapeutic proteins. We used erythropoietin (EPO) as a case study. Results: In an animal study with 129I-labeled EPO in Han-Wistar rats, an increase of 129I-EPO is observed after dose administration. The half-life was found to be 2 and 5.5 h for two different EPOs. These results are in accordance with expected values. Conclusion: Although further research is required, 129I-labeling of proteins seems a feasible method for AMS microdose studies with peptide and protein drugs, such as biosimilars.